This year it’s all about creating a DIY wedding confetti bar for your guests. 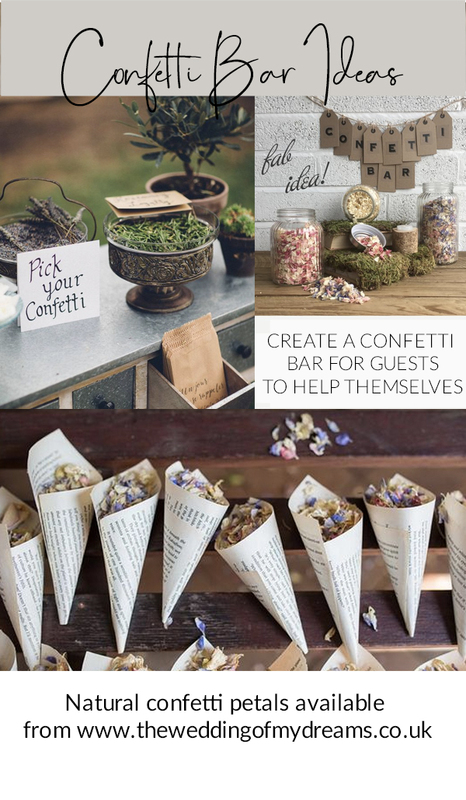 Whether you’re planning a metallic wedding day bursting with glitz and glamour, a rustic barn celebration or a summer party, a confetti bar is a fabulous addition to your big day. A confetti bar is surprisingly simple and easy to style and it’s a wonderful way of adding to your venue decor. 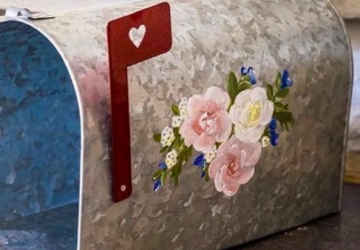 Plus, it gives you a chance to get creative and allows you to express your personality and wedding style. 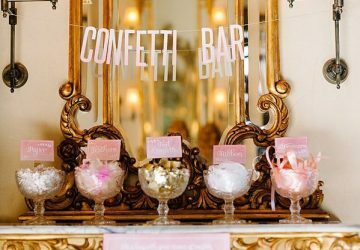 One of the best things about a wedding confetti bar is the fact that it can be designed to suit any theme and you can effortlessly make it unique. 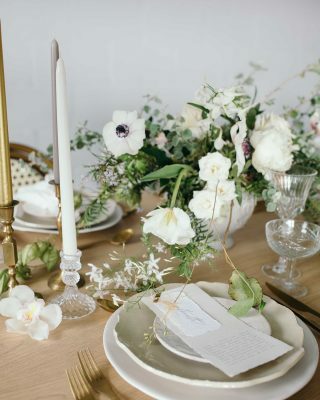 If you’re dreaming of a pretty vintage or country garden wedding theme, listen up! A quaint desk or table with an antique feel is the perfect base for your confetti bar. 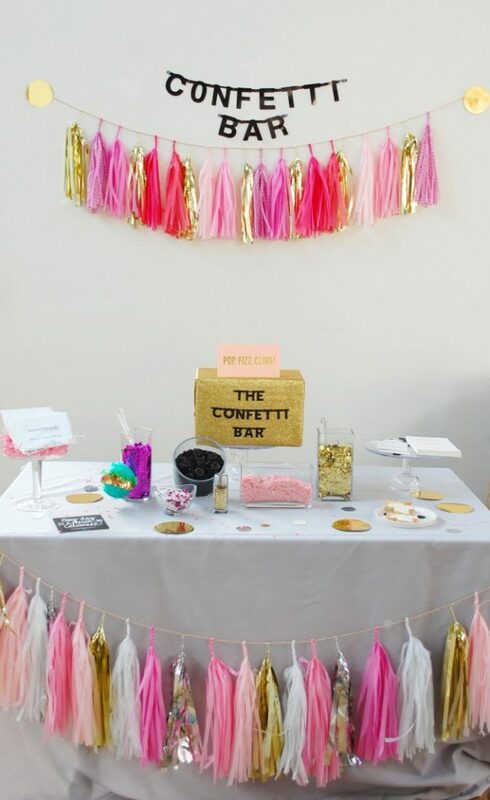 Use an old-fashioned sign, frame or chalkboard to let your guests know about your confetti bar, and stand it against the table. 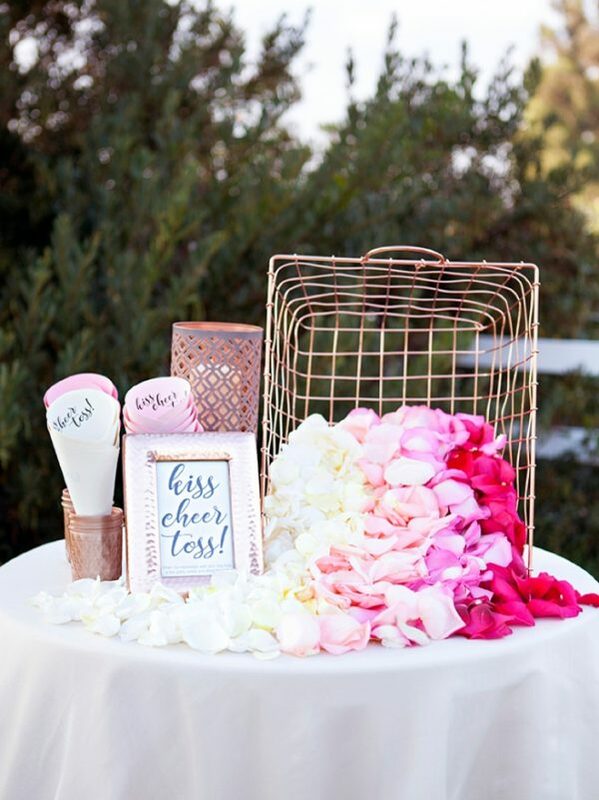 Fill vintage baskets with pretty petals and offer your guests cones adorned with lace detailing. Metallic wedding colour schemes are here to stay for 2017, so why not use gold as the inspiration for your wedding confetti bar? Metallic calligraphy written on mirrors or acrylic signs will look fab. Fill clear or gold vases with sequins, feathers or even glitter! You’ll sparkle for the rest of your wedding day. 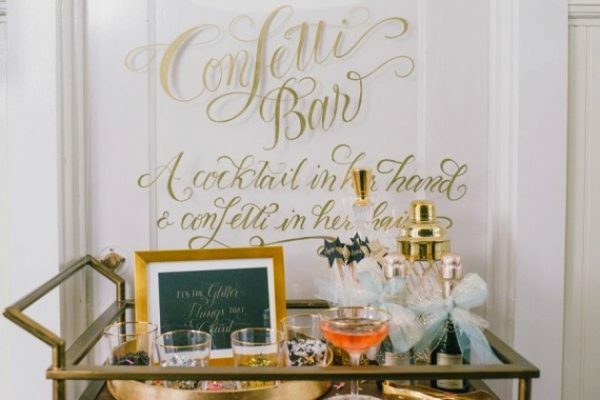 You could use a vintage-inspired bar cart as a base for your confetti bar – it’ll give your big day a dash of Gatsby glamour! 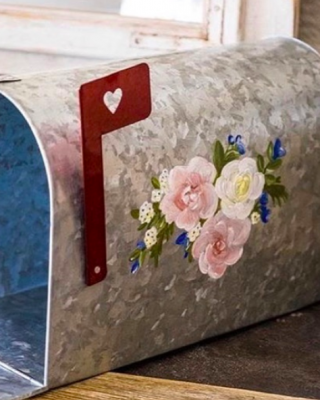 There are no rules when it comes to confetti, and it seems more and more couples are opting for alternative confetti ideas. 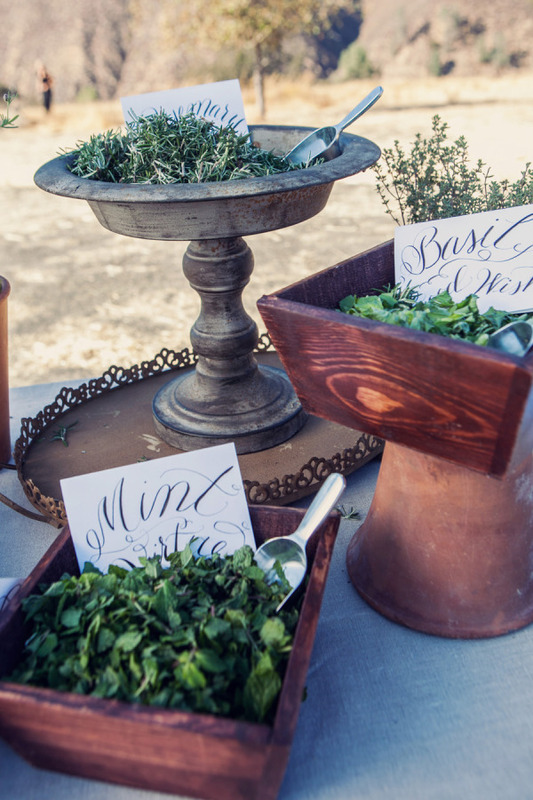 If you’re planning a rustic or destination wedding, we love the thought of using a variety of herbs as your confetti. From dried lavender to handfuls of mint – the choice is yours! We love the idea of displaying your confetti bar in a vintage chest of drawers, and using each draw as an compartment for different types and colours of confetti. Offer your guests scoops so that they can fill cones, jars or hessian bags with their chosen confetti. It’ll look ultra-stylish at your wedding venue, and it’ll be something your guests won’t have seen before. 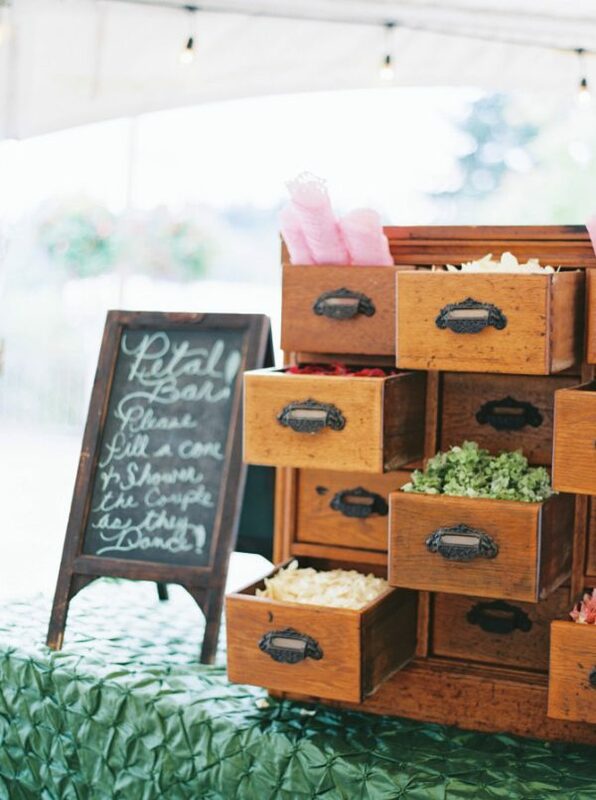 Wooden crates are seriously useful when it comes to wedding decor, and they can be used as part of your confetti bar. 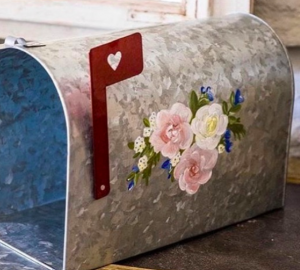 Fill the crates with loose petals, or use them as storage for kilner and mason jars brimming with confetti. 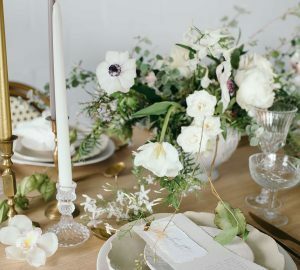 They’re a fab touch if you’re opting for a rustic or country wedding theme, and they’ll fit in with your decor perfectly. 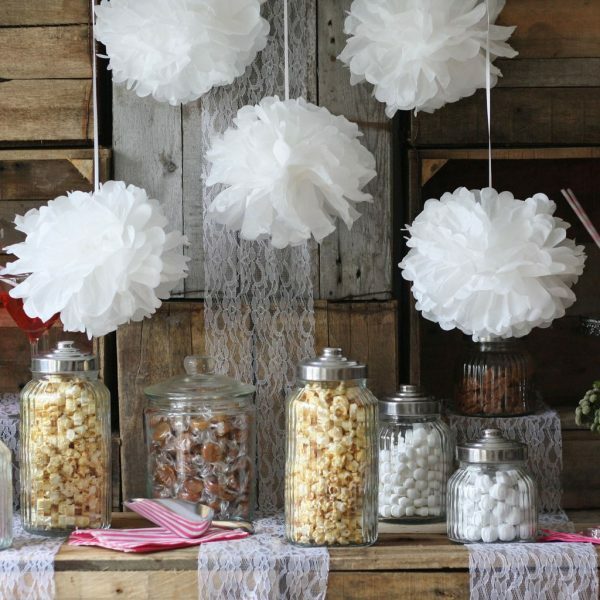 If you’re stuck for ideas on how to decorate your confetti bar – don’t fret! Tassel garlands in a mixture of colours look gorgeous hung behind your confetti bar or along the top of the table. 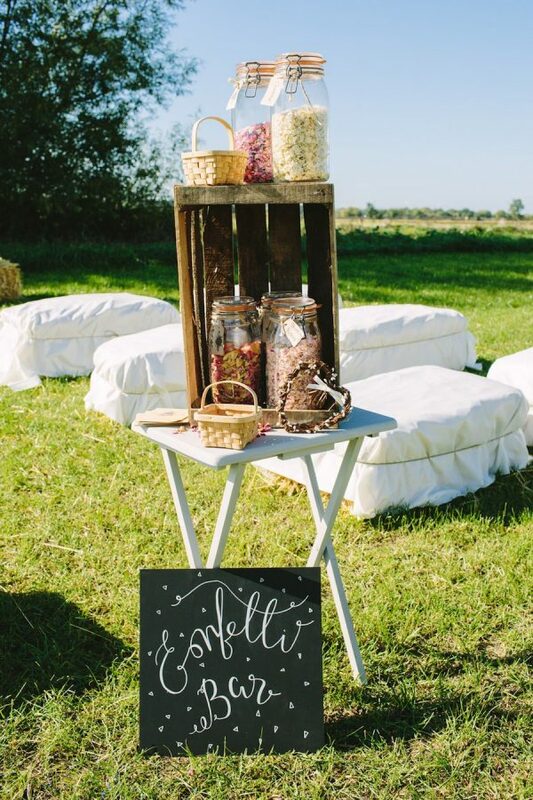 Why not spell out ‘Confetti Bar’ with some cute bunting and drape it across your confetti station? Offer your guests a variety of colours and types of confetti to choose from – they’ll love heading over to your bar and creating their very own cone of confetti. 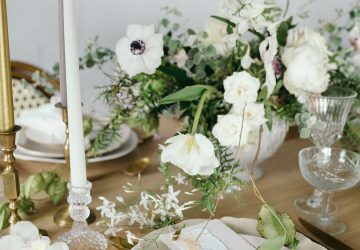 Are you planning a woodland wedding? Or perhaps you love the thought of an eco-friendly celebration? 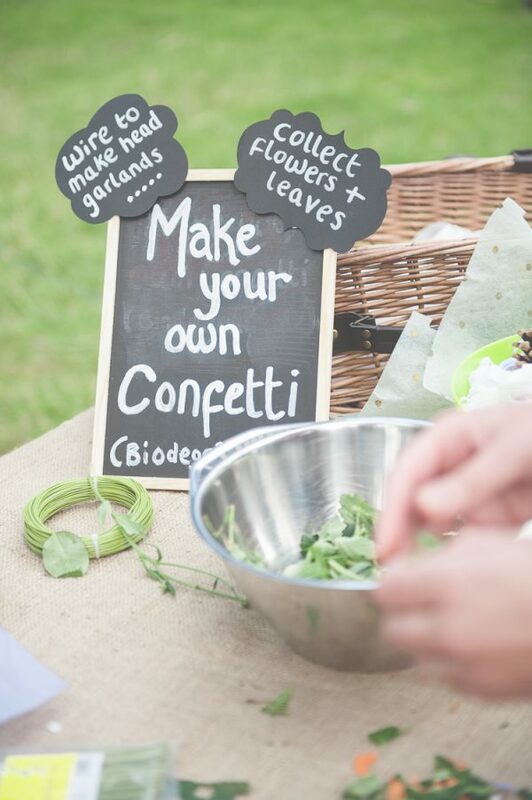 If so, consider creating a DIY confetti bar using natural flowers, leaves and woodland treasures. Simple wicker baskets will look lovely bursting with woodland-inspired confetti. There are so many ways to for your guests to collect their confetti. 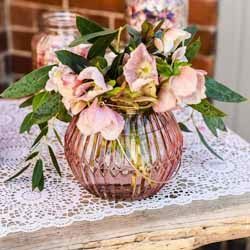 From mini burlap bags, pretty lace cones, jam jars, plastic cups or even baskets – the options are endless. Your guaranteed to find a style to suit your wedding theme! 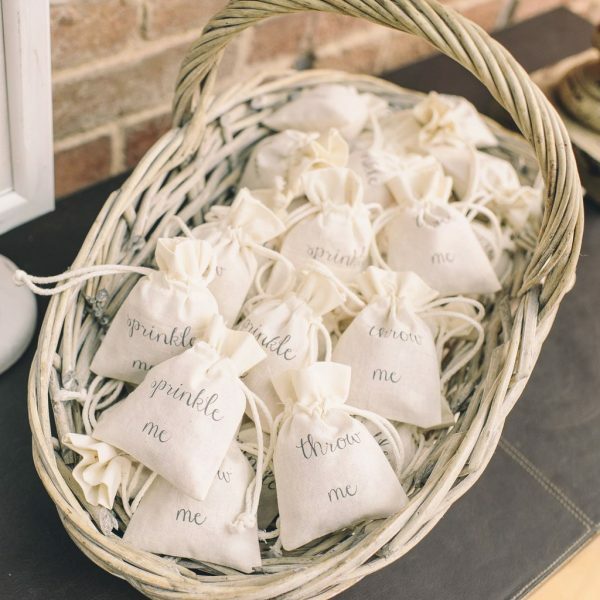 Our cotton bags have ‘Sprinkle Me‘ and ‘Throw Me‘ written on the front, giving them an extra special touch! You could even source personalised bags with your wedding date and names on the front. Our glass sweet jars are perfect for storing candy and tasty treats, but they also look wonderful filled to the brim with petals, glitter and colourful paper. 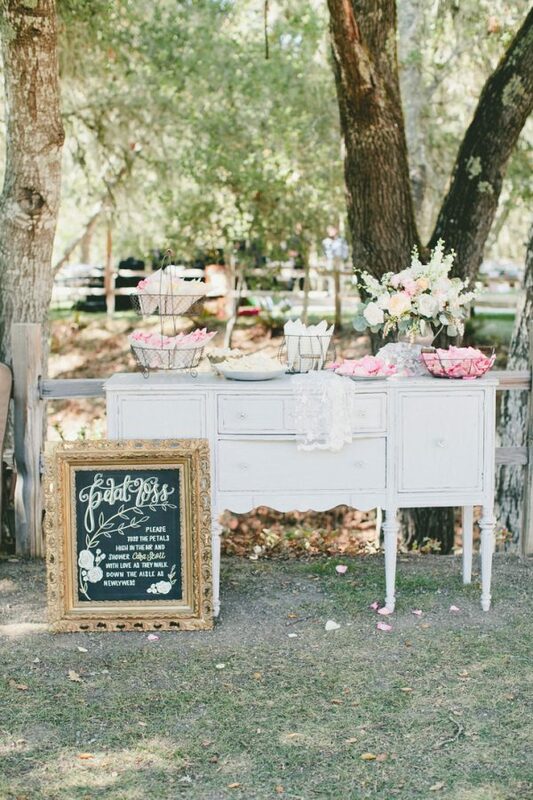 Display on a table with a chalkboard sign and decorate to your chosen wedding style. 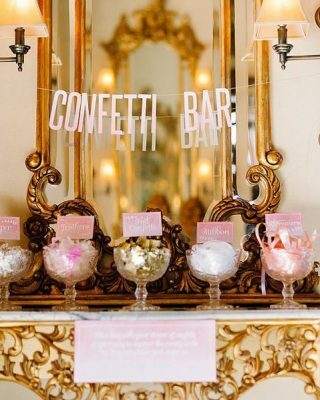 A confetti bar adds a unique and fun touch to your wedding decor and it gives your guests a chance to get involved during your special day. Do you love the thought of a confetti bar?